- Natural disasters/energy price increases etc. The quantity of real gdp supplied when all inputs employed. Long run: period of time long enough for all prices/wages to adjust to smith"s invisible hand. Short run: period of time where some input prices dont change. Lras: full-employment outcome of co-ordinated smart choices. Sras: quantity of real gdp macroecon players plan to supply at different price levels. Upward sloping, since input prices are fixed in short run. When prices rise, higher output prices with fixed input more profit. Sras and lras intersect at point where sras hits potential gdp. 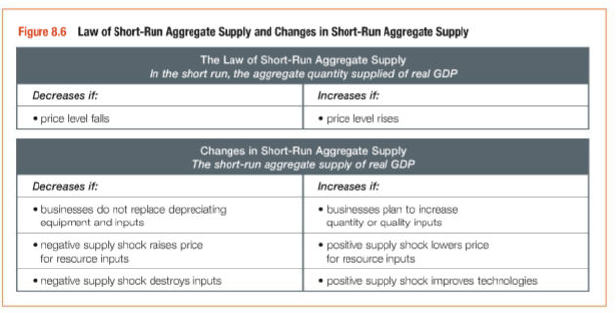 Law of sras: as prices rise, aggregate quantity supplied of real gdp increases. Anything that increases quality/quantity of inputs will increase potential. Change in input price and aggregate supply. Rise in input prices decreases sras, shifts leftward. Does not change potential gdp, so lras does not shift. Shift sras leftward (due to increased costs) No distinction between long and short run.